Birds sing to each other. Crows call back and forth. One bird flits by, sharing the flutter of its wings. Near my feet a feeling of joy and play come from the patter of little critters in the underbrush. Flowing water from a nearby stream offers calming sounds upon which troubles drift away, and a gentle breeze whispers invisibly through freshly budding branches. That whispering gentle breeze carries the delicate sweetness of freshly blooming flowers. The air itself shares a gentle moistness from misty morning rains. That rain is long past though, and now the sky is endless blue. Now the sun gives a comforting warmth. It’s a special warmth that touches deep inside, and makes the fresh springtime greens glow. All around, there’s so much life. If I were try to hold it, it would be too much. Instead of grasping, I just let it pass over and through. That’s what it is to pause and really be in this moment. Today’s post started as an informative article that would be a bit more in line with what I often share through BigSkyRise. Ultimately, that’s what BigSkyRise, and all of this, is really about. 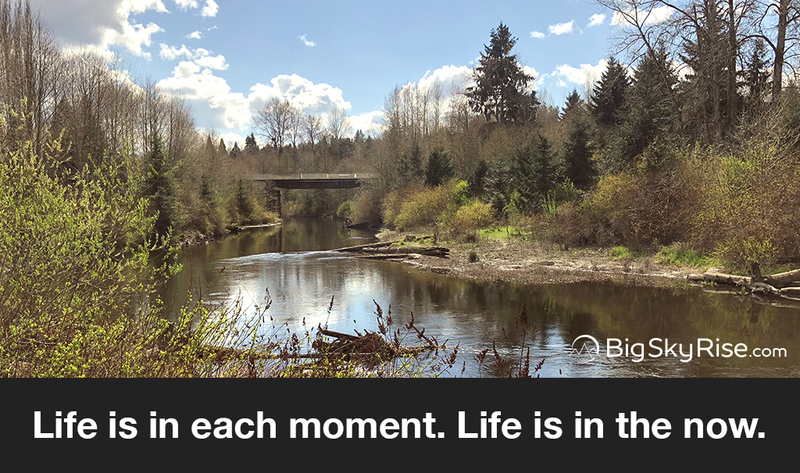 Being in the moment we are living. Beyond tips, how-to’s, techniques, and “one simple questions”, it’s about simply being. Being in the one moment we truly have, this moment, and seeing all there is to be grateful for in it. All too often we get caught up in the distractions and the noise. We focus in a way that disconnects us from the life and moments we’re in. Things happen in life that are hard. We lose track of life while trying to acquire some accomplishment. Or, for whatever combination of reasons, we simply get a bit lost and disconnected. So, today, I wanted to simply share one of my recent moments with you. My hope is that it might help you — and me — to remember to really “be” in more of them. When was a recent time when you paused and really connected with life?